Somewhat Quirky: 28 Things - What I've REALLY Been Doing . . .
28 Things - What I've REALLY Been Doing . . . I haven't been doing much of what I am supposed to do, like gardening, and cleaning, and cooking . . .
1. I've been working on this. 2. This is a humidor. A big humidor. 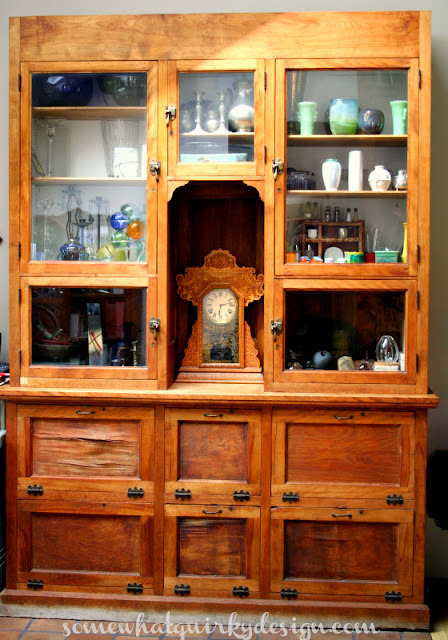 An old humidor. 3. You've met the humidor before, here. 4. It was one of my favorite pieces in this amazing house. 5. The humidor now belongs to me! 6. 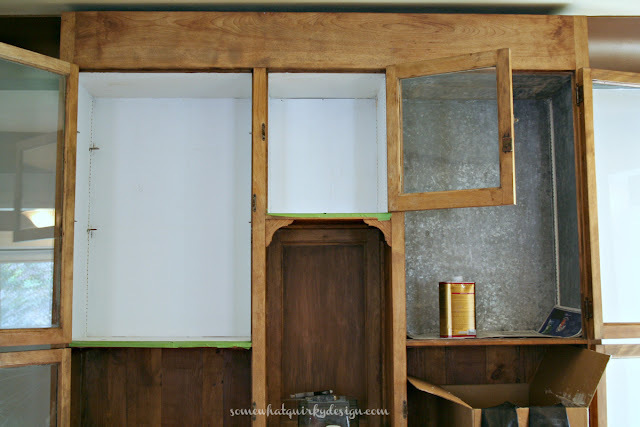 I was wondering if I should strip the paint that was in the upper cabinets - and then I figured out that this galvanized aluminum was behind the paint and I knew that the answer to my question was yes. Hell yes. 7. Stripping the paint off of the galvanized aluminum was HARD. Really hard. 8. The combination of the fumes from the stripper and the hard work would make me break out in a huge sweat. Sweat like I was in a shower sweat. Sweat that would drip in puddles on the floor. 10. It was really hard work. 12. I put Hemp Oil all over it. 13. Sammy loves Hemp Oil. 14. 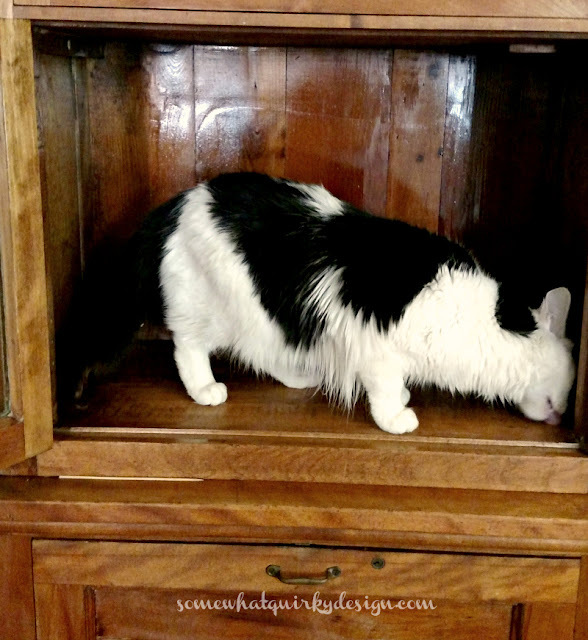 Hemp Oil is supposed to be food safe, but we researched it anyway - in regards to cats. 15. There are people in web-land that will swear that hemp oil cured their cat from cancer. 16. Speaking of cancer, we binge watched Breaking Bad over the last 2 weeks. 18. We also went to see Love and Mercy - a movie about Brian Wilson of the Beach Boys. 20. 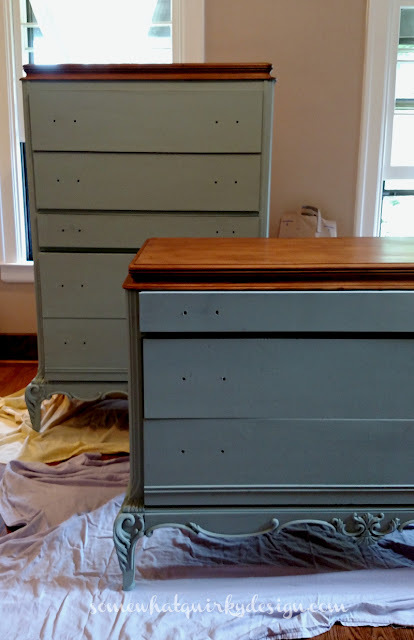 I've been painting these dressers for a client. 22. They are going to be fantastic - look at those tops! 23. I don't have any idea why they look like they are different colors. 24. Today began the "Week of Karen." 25. In case you don't know what that means . . . it's my birthday week! 26. The cake comes on Tuesday, and I cannot wait. 27. Mr. Quirky grilled beautiful filets for dinner tonight to kick off the week. 28. It takes a lot of celebrating to soften the sting of the 57. 28b. I should research why the 7s are harder than all the others. I had a hard time with 37 and 47. Now 57 feels oh so very close to 60. . .
What have you REALLY been doing??? Playing! Yep, too much playing and not enough projects! The wedding is less than 4 weeks away and I have got to get my guest room ready for family coming next week. The wedding stuff is spread across every surface of the guest room. Today I am going to tackle it. Happy birthday! I hope you have a fabulous week. Happy Birthday! That humidor cabinet is crazy beautiful. And I am so glad that I clicked the link to where you obtained it from, their house was very inspiring. 57? I'd have guessed younger. Birthday week and heck yeah, the week if Karen! That makes the second Karen I know with a birthday this week and the third for the month of June! Happy Birthday I hope 57 is an exception to to your 7 rule. I'm anticipating 53--- I just turned 50 in March. My mom died at the young age of 52-- you see the reason behind 53 now right? Lastly, why 28? I could go and search for the reason--- but who has that kind of time? Youve done 28 things a long time! Other than the sweaty visual you created, I'm thinking turning 57 means you can have as much dam cake as you want.